Transdisciplinary Journeys in the Anthropocene offers a new perspective on international environmental scholarship, focusing on the emotional and affective connections between human and nonhuman lives to reveal fresh connections between global issues of climate change, species extinction and colonisation. Combining the rhythm of road travel, interviews with local Aboriginal Elders, and autobiographical storytelling, the book develops a new form of nature writing informed by concepts from posthumanism and the environmental humanities. It also highlights connections between the studied area and the global environment, drawing conceptual links between the auto-ethnographic accounts and international issues. This book will be of great interest to scholars and postgraduates in environmental philosophy, cultural studies, postcolonial theory, Australian studies, anthropology, literary and place studies, ecocriticism, history and animal studies. 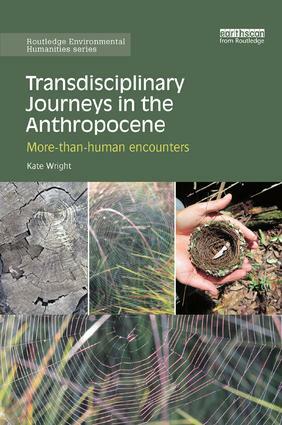 Transdisciplinary Journeys in the Anthropocene may also be beneficial to studies in nature writing, ecocriticism, environmental literature, postcolonial studies and Australian studies. Kate Wright is a Postdoctoral Research Fellow at the University of New England, Australia. She is currently immersed in an experimental, multispecies research project that involves developing and coordinating an Indigenous community garden in collaboration with Armidale’s Aboriginal community.